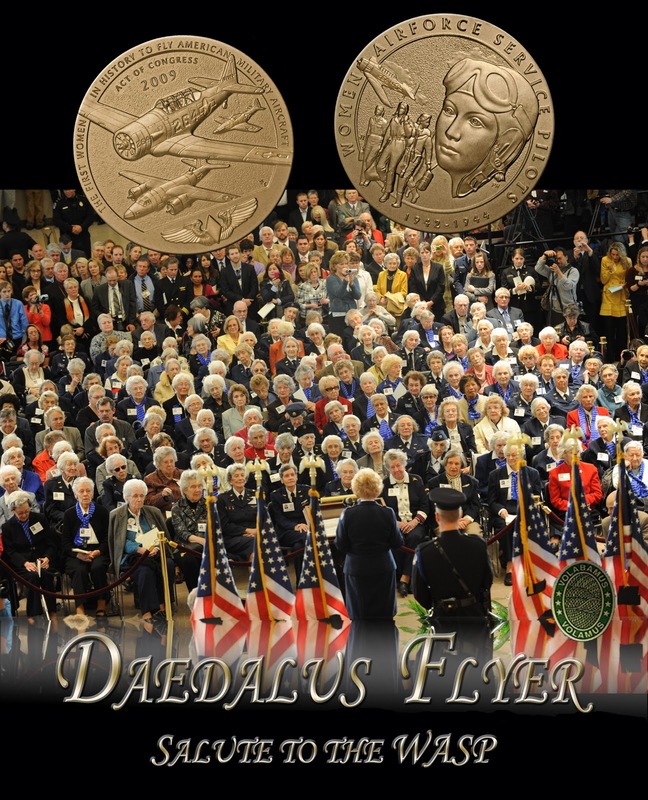 On the **cover of the ‘Flyer’ (right) is a spectacular photograph that captures an amazing event held March 10, 2010: a ceremony to award the Women Airforce Service Pilots the Congressional Gold Medal, the highest honor Congress can bestow on a civilian. That moment was the culmination of many years of hard work and persistence by one very determined Daedalian (James Connally Flight), who is standing at the podium, her back to the camera, her eyes on her WASP peers. She also happens to be my mom, WASP Deanie Parrish. Surrounding her are the shining faces of over two hundred WASP in attendance in the Capitol’s Emancipation Hall. As Speaker Nancy Pelosi said, “We had to turn hundreds of people away because we didn’t have a room big enough to contain the admiration that we all have for you.” It was the largest crowd in history to gather inside the Capitol! I marvelled at the parade of thank you’s. In just a few words, each speaker offered their own heart-felt tribute, from bill sponsors Sen Hutchison and Sen. Mikulski, Rep Ros-Lehtinen and Susan Davis, to Tom Brokaw and SECAF Michael Donley. I am, as you would expect, very proud of my mom. She meant it, every word. So, for my mom and all the WASP, THANK YOU DAEDALIANS for recognizing their service by inviting the WASP to become Daedalians in 2002. Your national recognition was one of many significant steps that brought them to our capitol on this miraculous day in March. A miraculous day, indeed. I know, I was smiling from the front row!